Political commentary and the lasting impact of Hartford’s G. Fox & Company Department Store are topics at two public brown bag lunch lectures in March at Capital Community College. Thursday, March 23, Noon to 1:30 p.m.
Bob Englehart, The Hartford Courant’s longtime editorial and political cartoonist, will share his craft and discuss his career at the Courant where he became “the oldest continuously published” newspaper’s first full-time editorial cartoonist. Mr. Englehart, who began his career at the Courant in 1980 and worked there through 2015 , has received awards from the Overseas Press Club, the H.L. Mencken Award, United Nations Populations Institute, Planned Parenthood, the President’s Medal from Southern Connecticut State University, the Free Press Association, Connecticut Society of Professional Journalists, and, in 1979, he was the finalist for the 1980 Pulitzer Prize. Thursday, March 30, Noon to 1:30 p.m.
Joe Waxman, a Connecticut Historical Society presenter, will reminisce about growing up in Hartford where the G. Fox store was part of his life and will share his admiration for Beatrice Fox Auerbach. This will be Joe’s second presentation at Centinel Hill Hall as part of the College’s Hartford Heritage Program. The March brown bag lunch lectures, organized by the Friends of Centinel Hill Hall and the CCC Foundation are sponsoring the March public lectures which are free and open to the public at the 950 Main Street campus. The organizers thank Humanities Professor Daniela Ragusa, Ph.D for making Bob Englehart’s appearance possible. 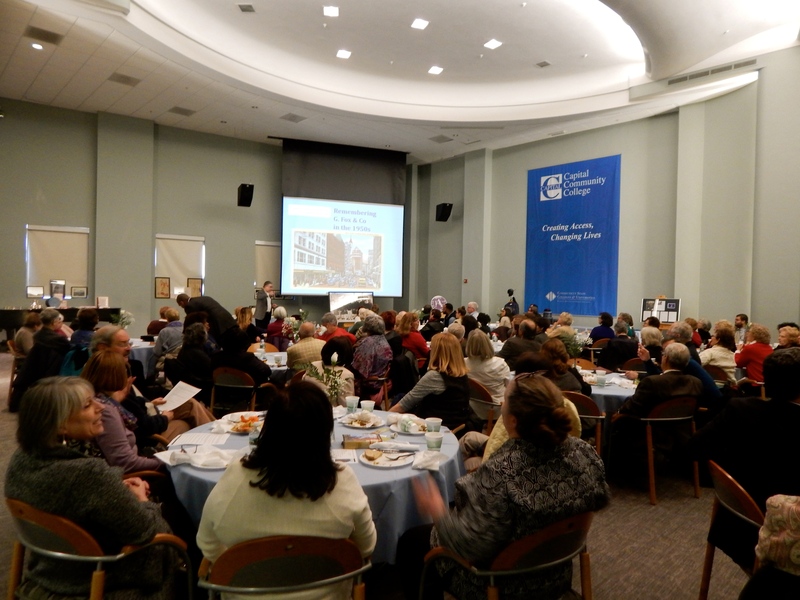 The lunches are inaugural events for the Centinel Hill Hall series that will include lunchtime talks, Hartford history lectures, Meet the Authors, Concerts at Capital and civic forums in 2017-2018 — the College’s 50th anniversary year. Capital Community College — which relocated to the former G. Fox & Company store in 2002 — is continuing the tradition begun by G. Fox & Company of using Centinel Hill Hall — the College’s historic, art-deco auditorium — as a community gathering place for music, the arts, culture and civic engagement. For a reservation and more information call the College advancement office at (860) 906-5102 or email CA-Foundation@capitalcc.edu. Complementary coffee, tea and beverages are provided. This entry was posted in Capital Community College, centinel hill hall, Events, G. Fox, Hartford Heritage. Bookmark the permalink.